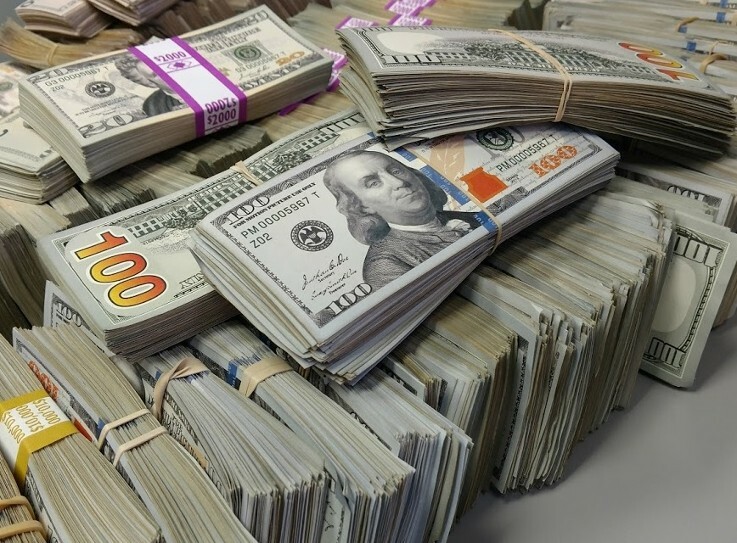 The most realistic legal Prop Money in the world: #1 Prop Money in Film and Television, Music Video, Commericials, Shows, Conventions, Las Vegas, Financial Training, Financial Presentations, and Law Enforcement. 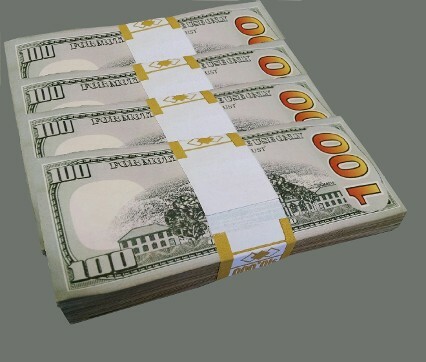 We sell or rent realistic Prop Money, Stage money, Fake Money. The colors and paper look real. 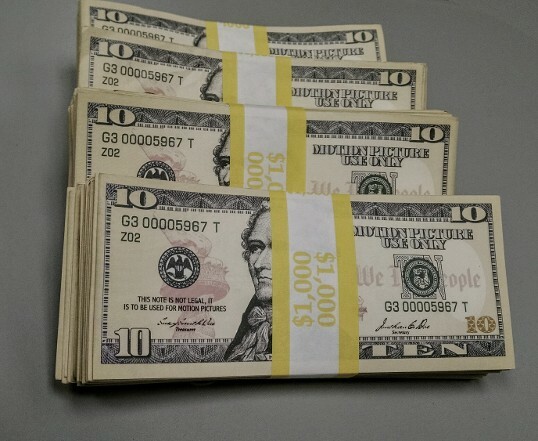 It might be Fake Money, but it looks real on camera. This has been in hundreds of feature films, television shows, music videos, commercials, advertisements and still photo shoots. We've done over 500 music videos and thousands of commercials. We carefully try to meet all legal requirements for Prop Money. 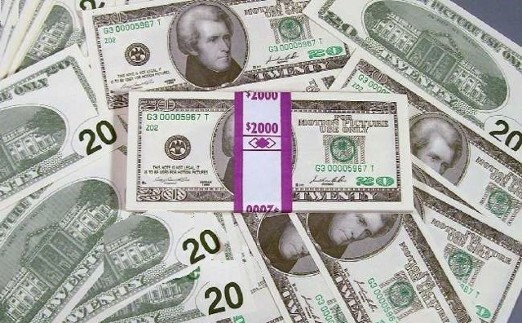 We have old style and new style: $1, $5, $10, $20, $50 and $100 bills. We sell it by the "stack". 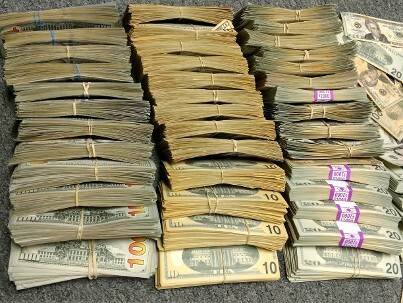 Each stack is 100 bills. READ THIS TO ORDER: We have 2 styles. Tell us how many stacks you need of each style. Standard-Grade is printed on both sides. Looks real from 3' away or further. Ideal for Music Videos, fanning, flashing, raining. It's $45/stack. Get 5 or more, the price drops down to $39/ea. Call for large Qty discounts. If you need to do Close-Ups, get our High-Grade. 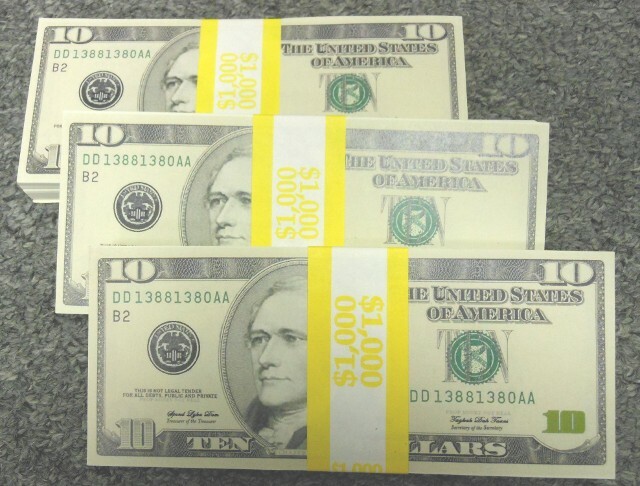 It looks exactly like real money. 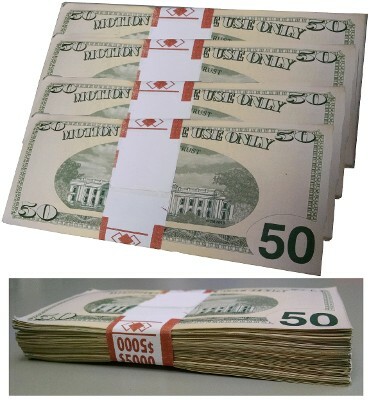 It's illegal to print realistic money on both sides, so High-Grade is 1-sided. It's $55/stack for High-Grade. Get 5 or more and the price drops down to $49/stack. Call for Qty pricing! TO ORDER: Call (404) 349-7600 or email us. Tell us how many of each style you want. We take credit card, gift card, or debit card. We ship USPS Priority Mail, 2 days to arrive. If you need it faster we can ship Fedex. Perfect for that "used look" for drug money, street money, close-ups. Choose your choice of: Full-Print or Filler. Distressed is cheaper because there's only 1 bill on top, and 1 bill on bottom. Middle is filled blank paper. Perfect for TV, Film, Music Video. Every bill printed front & back. Looks real from 20"
Call (404) 349-7600 or Click the photo to Order it! Call (404) 349-7600, or Click the photo to Order it! Distressed Prop Money. The most realistic available! Meets and exceeds all expectations on film! $65 a stack (each stack is 100 bills) Click here, or on the photo to Order it! 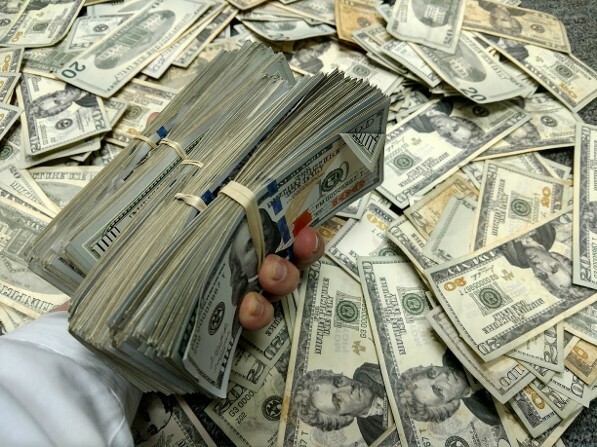 LEGAL NOTE: We have carefully tried to meet all legal requirements for Prop Money. 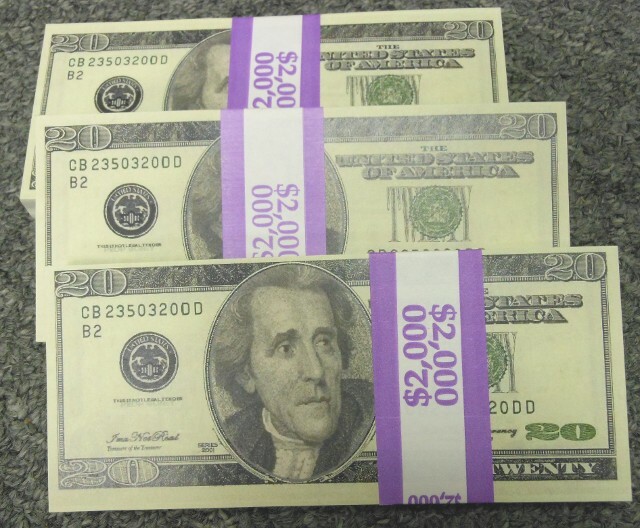 The Legal Features of the Prop Money are shown at the bottom of this page. Please scroll down to see the numerous legal features. We made 17 design changes to the front side, and 11 design changes made to the back side. Original artwork has been replaced and completely redesigned with different artwork. In addition, we replaced the seals with totally different seals. 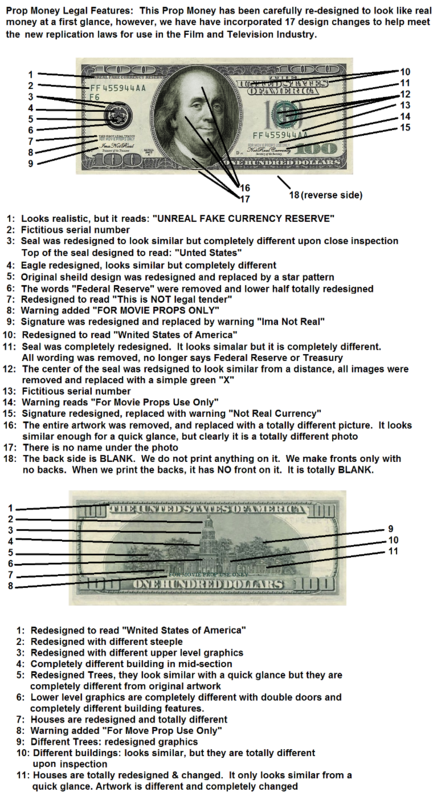 The prop money has multiple warnings that it is NOT real, and that it is NOT for legal tender. Furthermore, the money is NOT printed on both sides. If you order fronts, they have NO back side. The back is left blank. If you order backs, they have NO front side, it is totally blank. 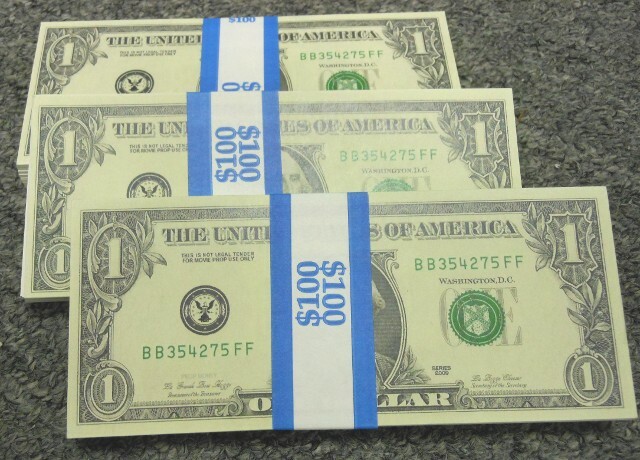 It looks like real money at a quick glance, but looking closely reveals that it is completely different artwork, different seals, multiple warnings that it is NOT real, and that it is NOT for legal tender. OUR NEW $100 BILL IS READY! It's printed on 1 side for legal reasons. 2-sided is not available. WARNING: We love our film community, so please be careful. 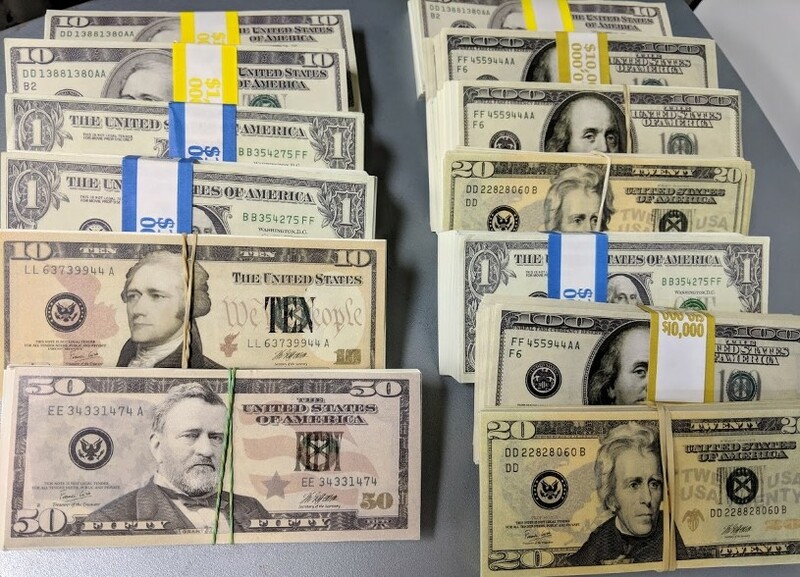 There is another prop money supplier who may be selling illegal prop money. We received phones calls from law enforcement warning us about it. Their money has been used in numerous crimes across the country. That seller may have violated numerous Federal laws and there may be a possible Federal Investigation. 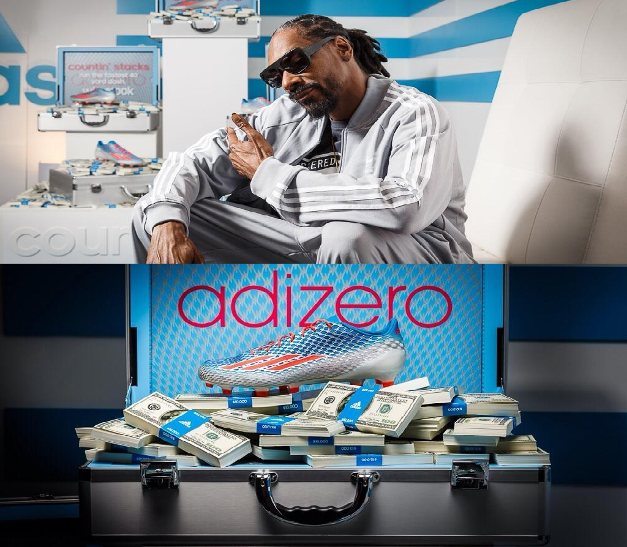 That money is turning up in Television, Film & music videos. 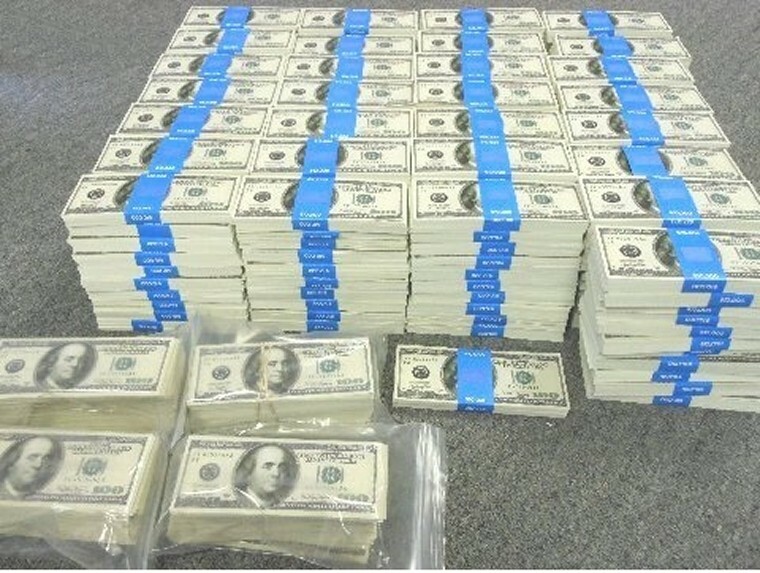 If you are caught using illegal prop money, Law Enforcement may shut down your production, edit out the scene, pull down the video, and you may be fined or face jail. 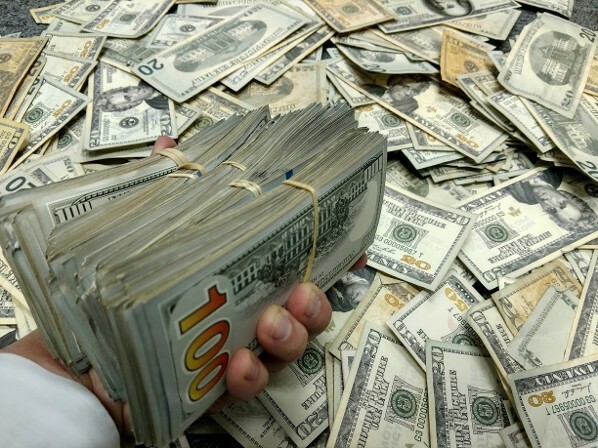 We carefully try to follow all laws to ensure our Prop Money is correct for Film & Television! Please call us if you have questions. This is the new style bill of our Prop Money. It looks amazing. Call for large Qty discounts! 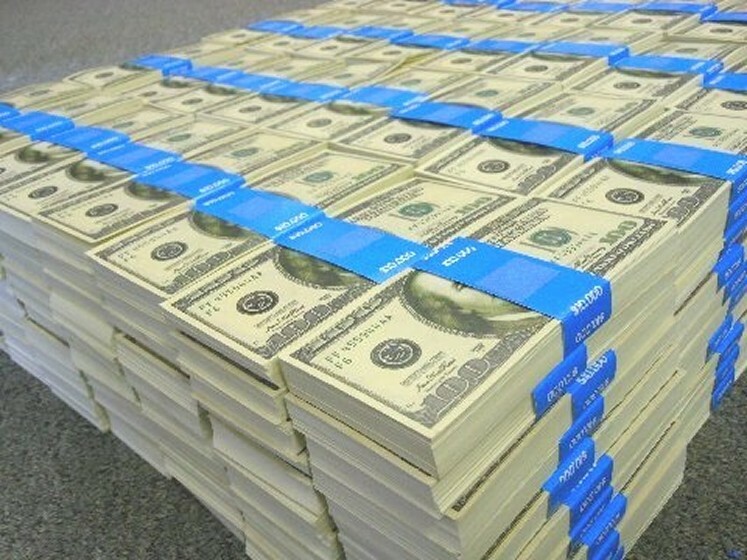 Looks like a FAT WAD of $100 Bills. This is perfect for anyone needing a realistic WAD of money. Its made of 35 bills. 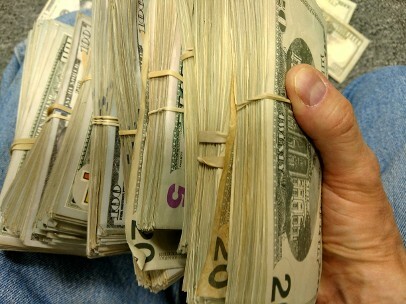 Ideal for drug deal scenes, bank roll scenes, Music Videos, etc. 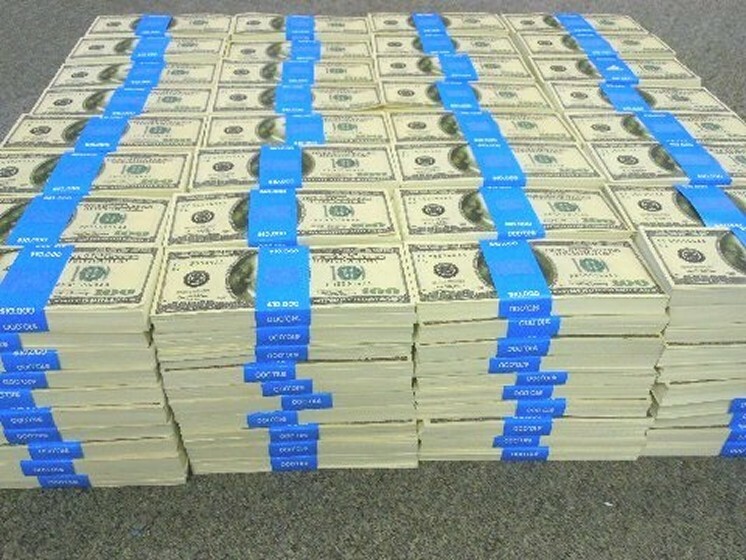 Looks like a FAT WAD of $100 Bills. This is perfect for anyone needing a realistic WAD of money. 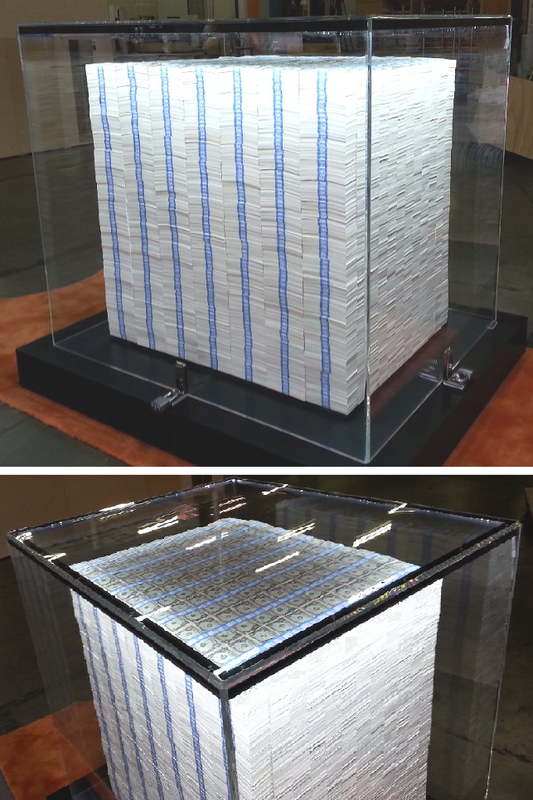 Its made of 35 rolled bills. 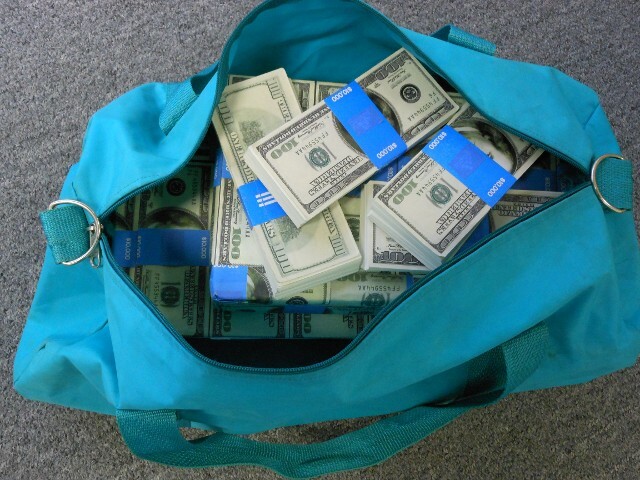 Ideal for drug deal scenes, bank roll scenes, Music Videos, etc. Looks great! Looks like $10,000. It's printed with a bill on the top, and a bill on the bottom, but it has blank paper inside to save you money when you dont need to fan or flash it. Great low-cost prop money. 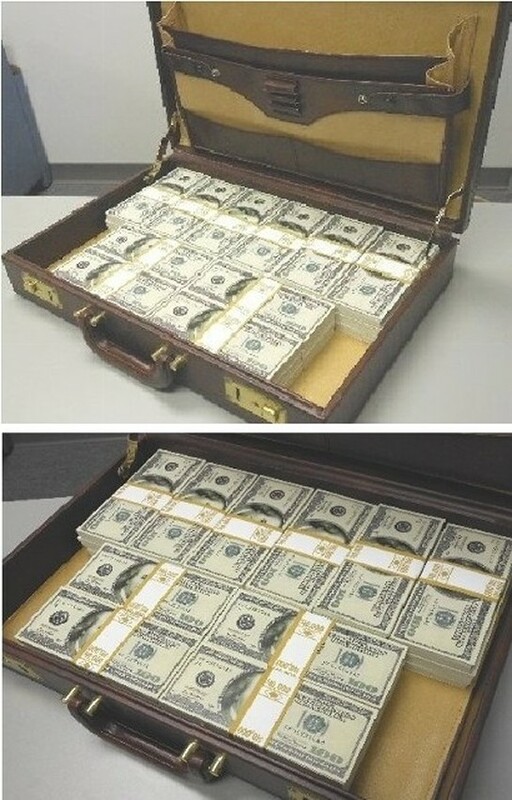 Ideal for bank robbery scenes, briefcase full of money, duffle bag of drug money, etc. This style is NOT good for fanning/flashing because there is blank paper in the middle. You need FULL PRINT stacks if you want fanning and flashing! Full Print is printed all the way through. Look down at the next listing to get our FULL PRINT money. Looks great! Looks like $10,000. Every bill is printed on BOTH sides all the way through. Every bill is printed front and back. Ideal for fanning, flashing, making it rain, etc. If your'e making a music video, get 3-5 stacks for a good full look. More looks better. If you're making it rain, you will need 4 stacks minimum to make a descent looking shot. This is Standard-Grade Full-Print. 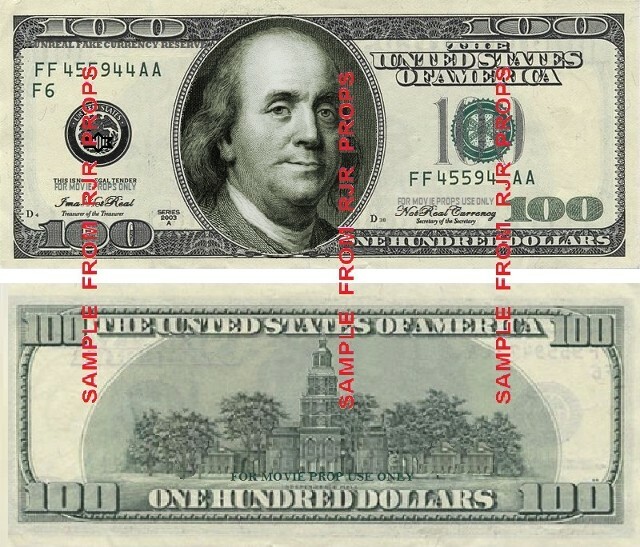 Full print means it's fully-printed on every bill (printed on front and back all the way through). Perfect for fanning, flashing or raining money. 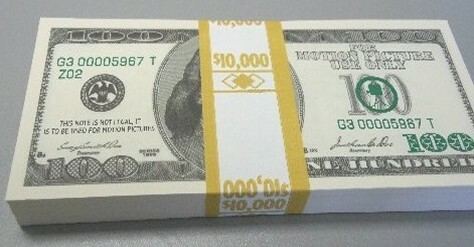 We sell or rent it in a stack of 100 bills ($10,000). Looks completely REAL! It's so realistic we're only able to print it on 1 side. If we printed it on both sides it would look too real and it would be considered counterfeit. GREAT for fanning, flashing and close-ups. Can't use it for rain scenes because it's blank on the back side. Get this for your close-up shots. BUY it for $45/Stack of 100 bills. Need large Qty? Call (404) 349-7600 for discount pricing. 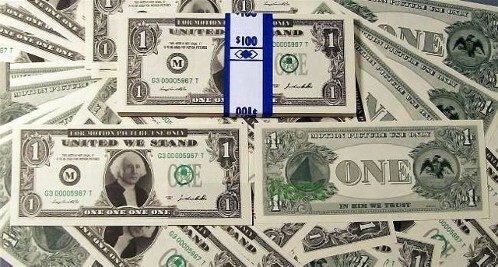 PUT YOUR COMPANY ON MONEY! 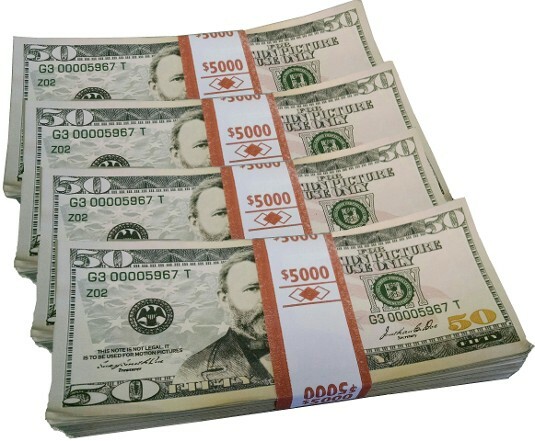 We can put your face or your company on Prop Money! 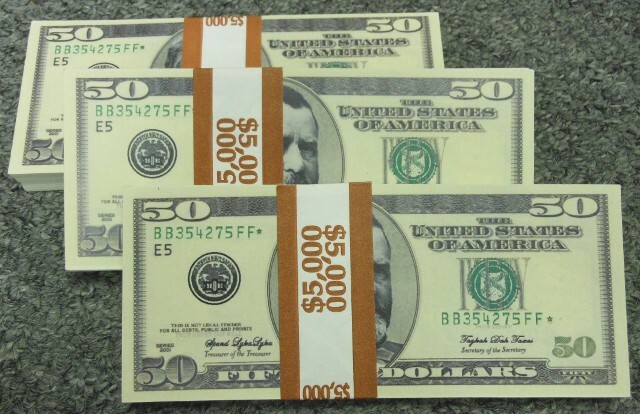 Send us a photo or your face, your company, or your logo, and we can put it on Prop Money! Call for info on putting your face on money! 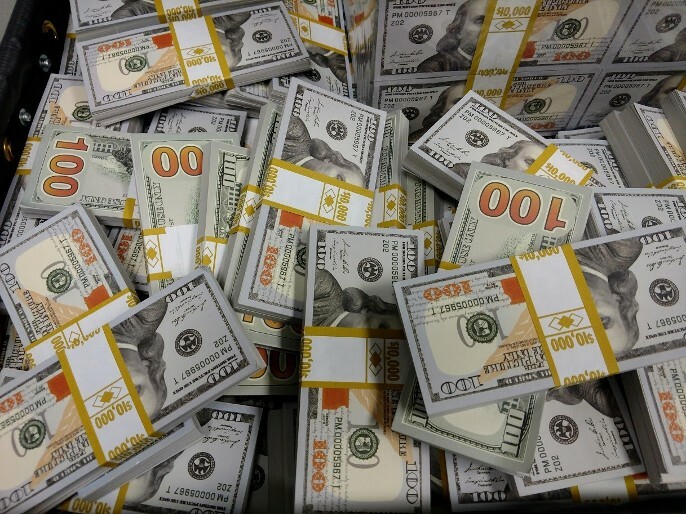 Note: We produce Prop Money specifically for use only in the Entertainment Industry only: Motion Picture, Film, Television, Music Video, Theatre, Exhibits and shows. 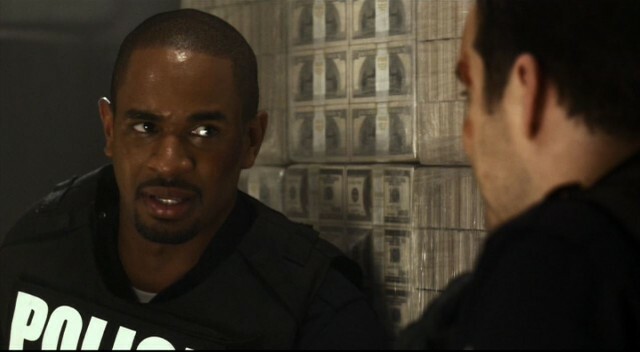 We strictly follow all laws and guidelines regarding the production of prop money. We will not produce illegal counterfeit so please do not ask us. 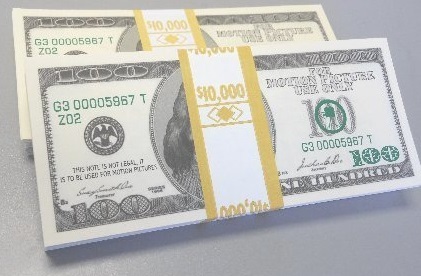 RJR's Custom Prop money was featured in Alex Wang's 10th Anniversary bash in NYC. Our money was featured in NY TImes, Fashionista, Fashion Week Daily, New York Magazine and more. RJR made a pallet of money for a recent show on the West Coast. This was made for a high-end client. The base is a fine polished wood laqcuer. The cover is a heavy-duty acrylic dome with built in lighting. We used over 3390 stacks of money to create the outer shell design. It was all printed, hand-cut, strapped, hand stacked, and we used a proprietary method to hold it together in perfect columns. This took a team of ten people two weeks to create it. It weighs over 1000 lbs. This is is for Close-ups. It looks great! But it's so realistic we can only print it on one side. It's $45 for a stack of 100 bills. This is is for Close-ups. It looks great! But it's so realistic we can only print it on one side. It's $45 for any stack of 100 bills. 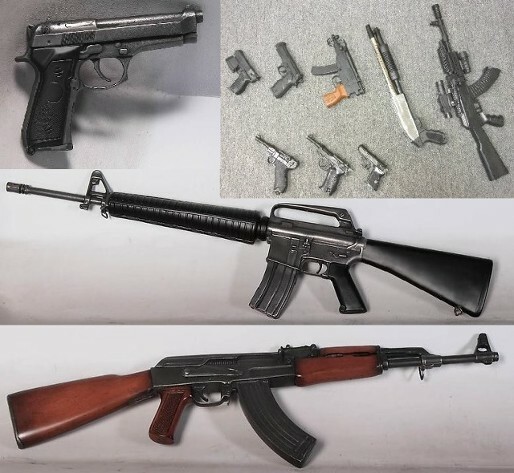 We have a large selection of Prop Guns for your video. Ask about our Prop Guns! Looks great! Looks like $20,000. It's printed on BOTH SIDES! Printed all the way thru: every bill is printed. Perfect for fanning, flashing or raining money. Looks great! Looks like $20,000. It's filled with blank paper to save money. Ideal for cheap piles of money, and low-cost money in a duffle bag or briefcase. This style is NOT good for fanning/flashing because there is blank paper in the middle. You need FULL PRINT stacks if you want fanning and flashing! Full Print is printed all the way through. Look at the previous listing to get our FULL PRINT money. Looks great! Looks like $30,000. It's printed on BOTH SIDES! Printed all the way thru: every bill is printed. Perfect for fanning, flashing or raining money. Looks great! Looks like $30,000. It's filled with blank paper inside to save money. Ideal for cheap piles of money, and low-cost money in a duffle bag or briefcase. Looks great! Looks like $40,000. It's printed on BOTH SIDES! Printed all the way thru: every bill is printed. Perfect for fanning, flashing or raining money. Looks great! Looks like $40,000. Ideal for cheap piles of money, and low-cost money in a duffle bag or briefcase. Looks great! Looks like $50,000. It's printed on BOTH SIDES! Printed all the way thru: every bill is printed. Ideal for fanning, flashing and making it rain money. Looks great! Looks like $50,000. 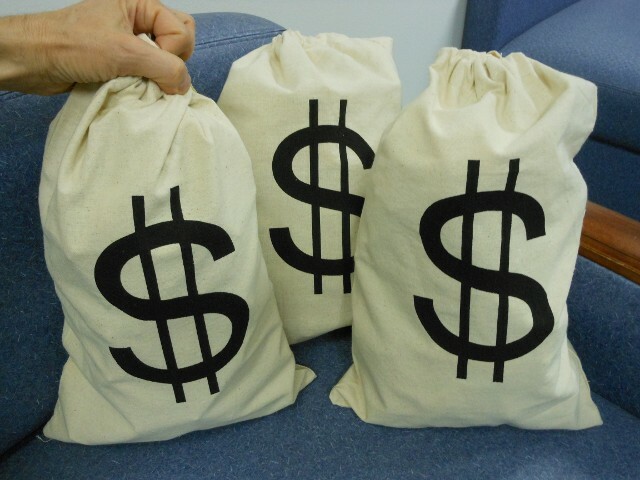 Ideal for cheap piles of money, and low-cost prop money in a duffle bag or briefcase. This style is NOT good for fanning / flashing because there is blank paper in the middle. You need FULL PRINT stacks if you want fanning and flashing! Full Print is printed all the way through. Look at the previous listing to get our FULL PRINT money. Looks great! Looks like $60,000. It's printed on BOTH SIDES! Printed all the way thru: every bill is printed. Looks great! Looks like $60,000. Ideal for cheap piles of money, and low-cost prop money in a duffle bag or briefcase. NEED MORE STD-GRADE PROP MONEY? BUY Full-Print Stacks for $45/stack for up to 10 stacks. Need large Qty? Call for (404) 349-7600 for Qty discounts! Need large Qty? Call (404) 349-7600 for Qty discounts! Looks REAL but it's only printed on one side. GREAT for fanning and flashing. Can't use it for rain scenes because it's blank on the back side. This style is PERFECT for close-ups! Looks great! If you need large Qty, call for discount pricing. You can see the back side of High-Grade is blank. We have a large variety of Prop Guns available. Please ask about our prop guns. Looks great! Looks like $5,000. It's printed on BOTH sides all the way through. Every bill is printed front and back. This style is for fanning, flashing, making it rain, etc. If your'e making a music video, get 3-5 stacks for a good full look. More looks better. If you're making it rain, you will need 4 stacks min to make a descent looking shot. Looks great! Looks like $2,000. It's printed on BOTH sides all the way through. Every bill is printed front and back. Looks great! Looks like $1,000. It's printed on BOTH sides all the way through. Every bill is printed front and back. Looks great! Looks like $500. It's printed on BOTH sides all the way through. Every bill is printed front and back. Looks great! Looks like $100. It's printed on BOTH sides all the way through. Every bill is printed front and back. This is the ultimate mix of filler stacks. Look like a BIG ROLLER without paying big bucks! 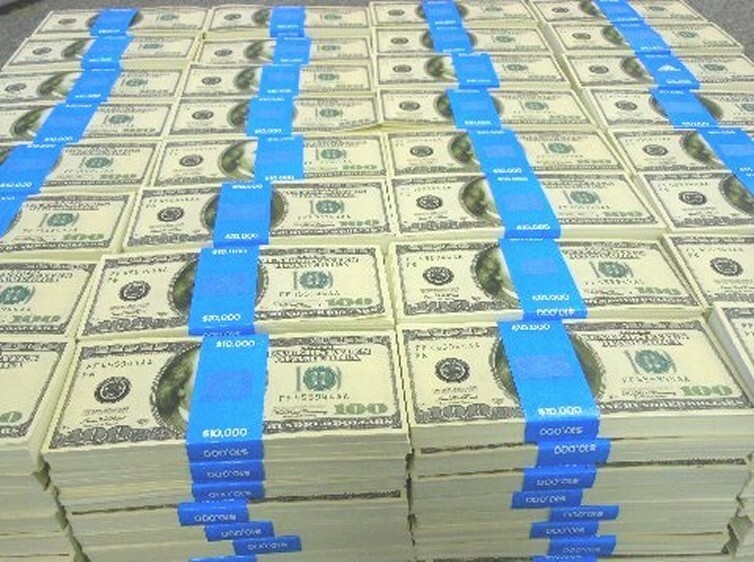 Keep in mind, these are filler stacks, filled with blank paper. 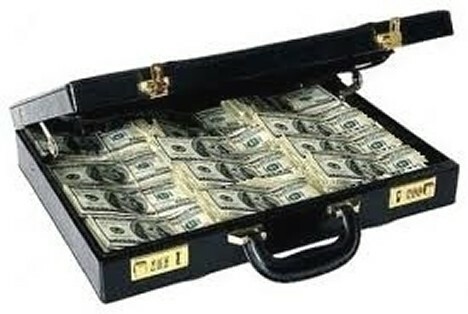 This is ideal for a suit case of money, briefcase or duffle bag. Cannot use it for fanning, flashing or making it rain. You need FULL PRINT for that. Look at the next frame down to see the FULL-PRINT for fanning, flashing, making it rain, etc. This is the ultimate mix of filler stacks. Look like a BIG ROLLER without paying big bucks! 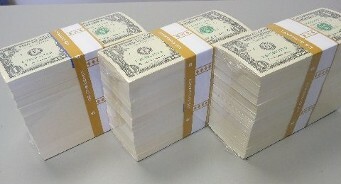 Keep in mind, these are FULL-PRINT STACKS, EVERY BILL IS PRINTED fron and back. Great for fanning, flashing, throwing, making it rain, etc. 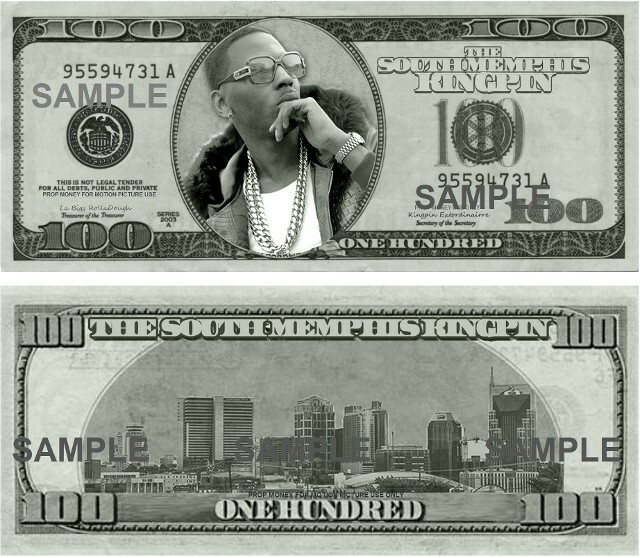 We can put your face or company on prop money. You supply the photo and info, we will make it! Ask about your face on Prop Money! 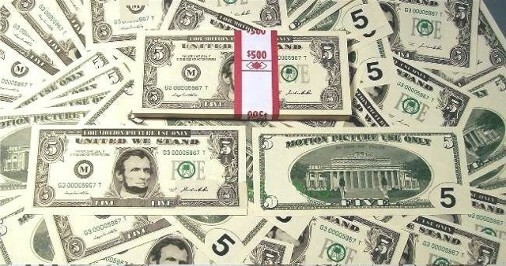 Please note: We produce prop money strictly for use in Television, Film, and music video. 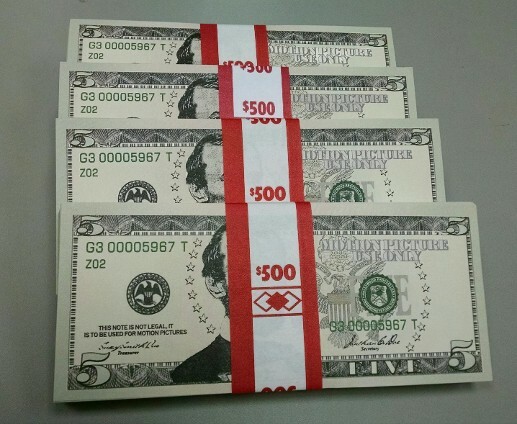 We will not violate counterfeiting laws, even if you ask nicely or offer more money. 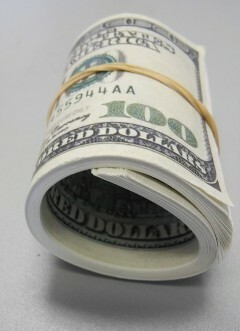 We strickly follow all laws and guidelines for the production of Prop Money for the Television and Film Industry. Large 17" x 11" each! This is our high-grade prop money. 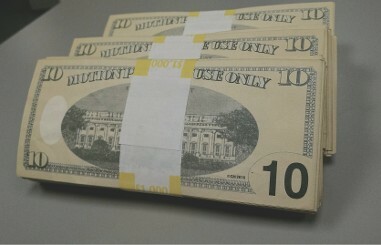 It comes in filler-stacks (blank paper in the middle) or in full-print (every bill is printed). It looks great! Dont forget, it's only printed on one side. 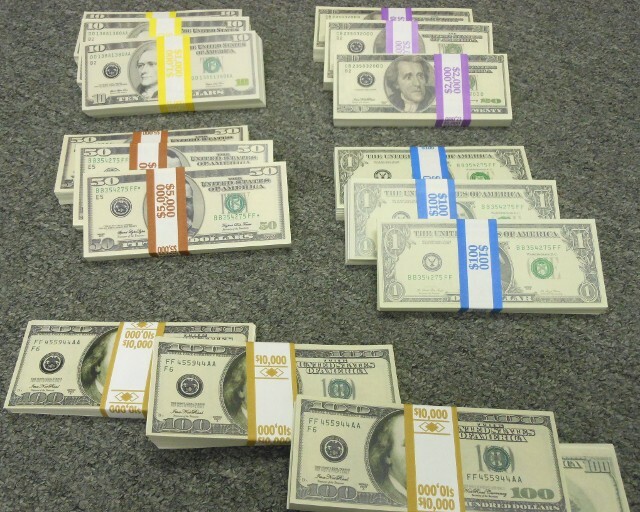 It looks excellent for counting, fanning, flashing, ranson scenes, bank robbery scenes, drug money, etc. 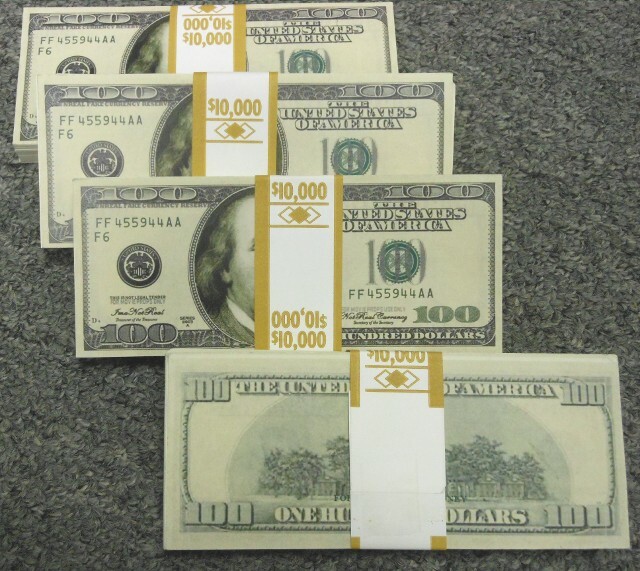 We have 2 grades of Prop Money available: Standard Grade and High-Grade. And we have 2 ways of printing the stacks. We have Full Print stacks (printed all the way through) and Filler Stacks (has blank paper in the middle). Standard Grade: This is the same grade used in Hollywood movies, Films, TV shows and Music Videos. 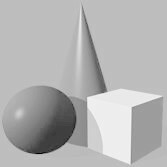 This has appeared in many scenes in Feature Films. Standard grade looks fine for all normal work, and for music videos. It is double sided: it a has a front and a back on each bill, just like real money. It looks good from 24 inches away. But it's not good for a tight close-ups because the viewer might notice that it's not real, and the president looks slightly different. It's good for all normal work, but not close-ups. 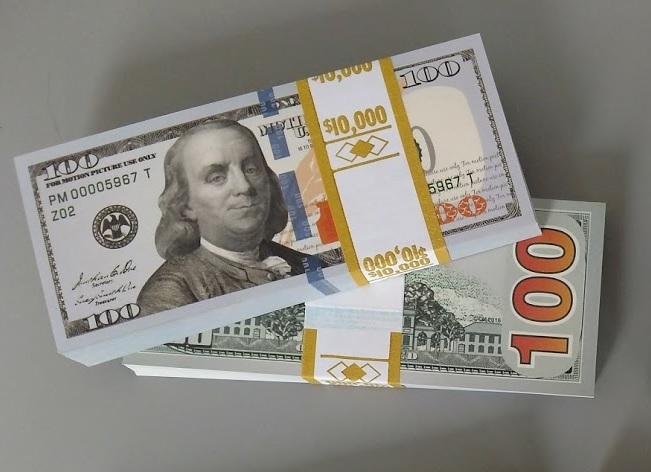 It comes in Full-Print (every sheet has money printed on it), or Filler-Stacks (there is 1 bill on the top and 1 on the bottom, and blank paper in the middle). 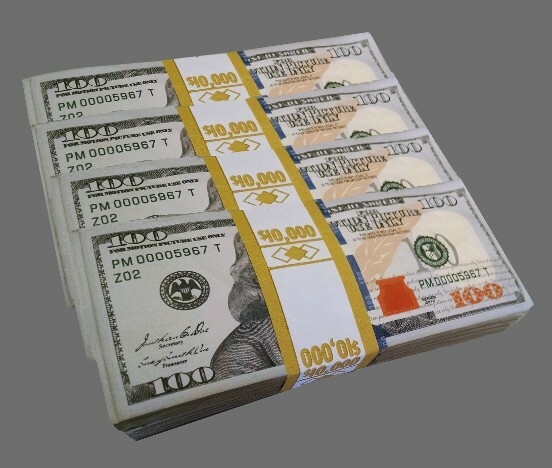 High-Grade: Our High-Grade Prop Money is very realistic. It is ideal if you need realistic money for tight shots, but it's only printed on one side due to counterfeiting laws, because it's so real looking. 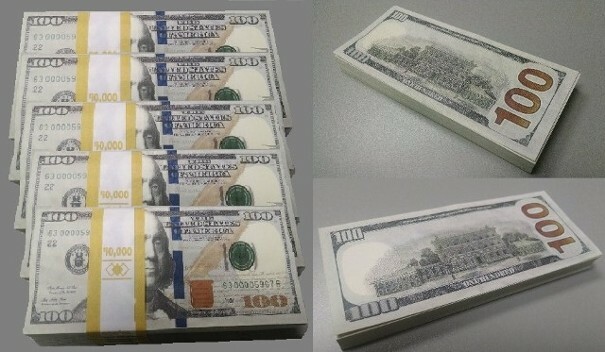 HIGH-QUALITY prop money is perfect for fanning, flashing & tight shots because it looks exactly like real money (but remember, it has no backs). High-quality is only printed on the fronts. It comes in Full-Print (every sheet has money printed on it), or Filler-Stacks (there is 1 bill on the top, 1 on the bottom, and blank paper in the middle). Ordering: When ordering, choose how many stacks you need. You need to decide if you need Standard Grade (that have fronts and backs), or if you need ultra-realistic High-Grade (fronts only). Most people get stacks of Standard Grade (double-sided) for their normal shots, and they get stacks of High-grade for their closeup tight shots. Also, try to decide how many "Filler stacks" you will need. 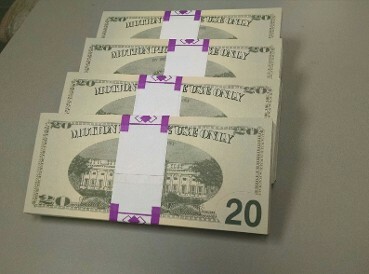 A filler stack has one "bill" on the top and one "bill" on the bottom, and the middle is filled with blank paper. 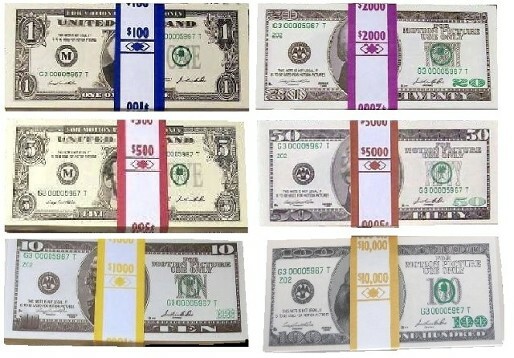 On camera, it looks like a lot of real money, but only you know it's blank in the middle. This can save you a lot of money because it's cheaper to get Filler Stacks. Please let us know what you need. We can provide it. Call to reserve your Prop Money today! (404) 349-7600. This is Full-Print (printed all the way thru). Ideal for normal film & television. If you need a close-up, get our High-Grade (shown further down on this page). Hint To Save money: only get a few Full-Print stacks, the rest can be Filler Packs. you got it. Each stack is $10,000. Each stack is about 3/4" thick and it comes banded. If you rent, the deposit is only $10 per stack. You get it back when you return it. If you get 10 or more stacks, take off an additional 10%. 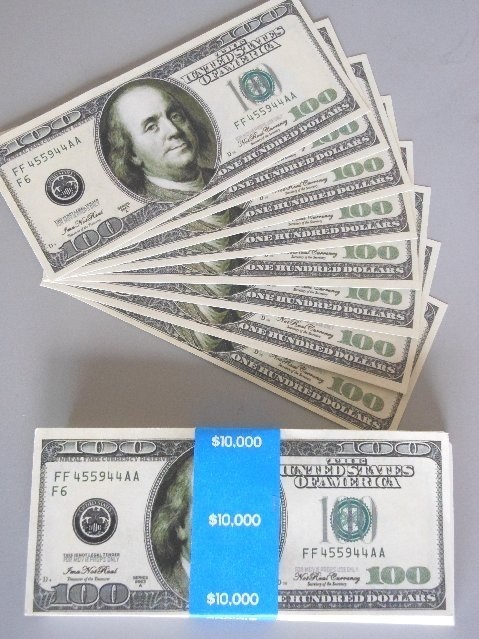 HERE IS OUR HIGH-GRADE PROP MONEY: High-Grade Prop Money is ultra-realistic It is the most realistic Prop Money available. 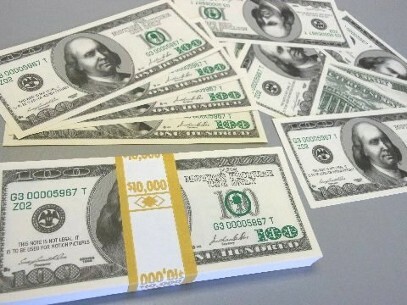 It has slight changes from real money, but it looks very realistic on film. We carefully made re-designs to try to meet all requirements of replication for Film and Television use. Please keep in mind that there are no backs on these due to counterfeiting laws. If you want to see all the legal changes we made, to meet the requirements, please scroll to the bottom of this page. 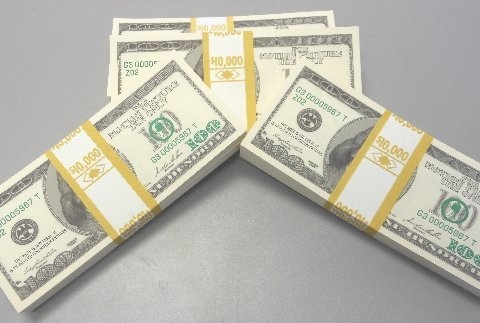 This Prop Money looks incredible. PLEASE let us know how many stacks you need. Thank you! Please ignore the red letters. We put it there on our website to show that it's a sample. 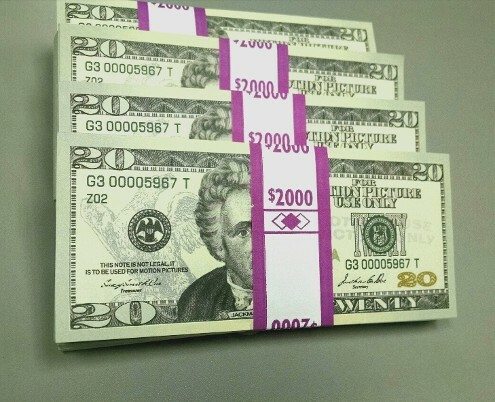 When you get the prop money, it will NOT have red on it! This is ideal for bank robbery scenes, drug money scenes, etc. Size: approx 18" long by 12"
This looks VERY realistic. 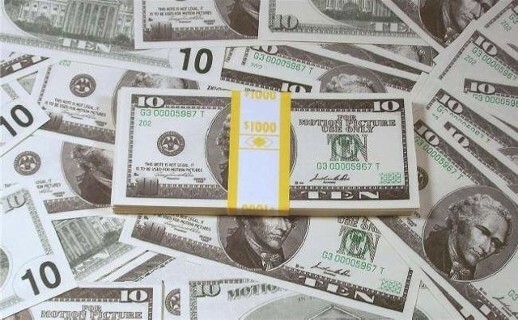 It is the most realistic Prop Money available in the world. It's printed only on the front side, not the back. To save money only get a few Full-Print stacks, the rest can be Filler Packs. They look real, and only you will know they're fillers. Remember: it's cheaper to Rent, especially if you are getting a lot. This will save money. Make sure you return on time, in the same condition you got it. Each stack is $10,000. Each stack is about 3/4" thick and it comes banded. If you rent, the deposit is only $20 per stack. You get it back when you return it. If you get 10 or more stacks, take off an additional 10%. Shipping cost is TBD, depending where you are located, and how fast it's shipped..
Standard Grade, or the High-Grade. Thanks. CALL (404) 349-7600. WE TAKE ORDERS BY PHONE. .Most Music Videos get 1-2 stack of "full-prints" for fanning and flashing. And they get 4 or 5 stacks of filler stacks to look good and fill in the scene. "filler stacks" to make it look like more money in the scene. videos only need 1 stack to fan or flash. you will need. And choose if you need Standard or High-Grade. Thank you! 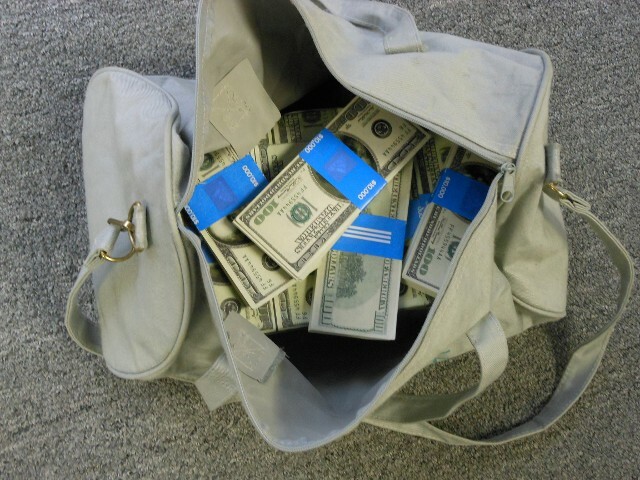 We also have duffle bags of money. 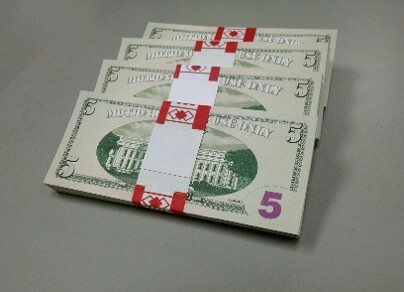 We recently made these "U.S. Treasury" stacks for a customer. 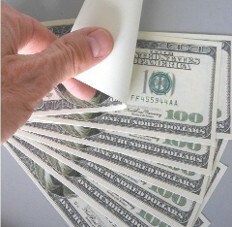 Each 12" stack is really (10) filler stacks put together into 1 big stack of 1000 bills. It is GIANT. It's about 12" Tall. 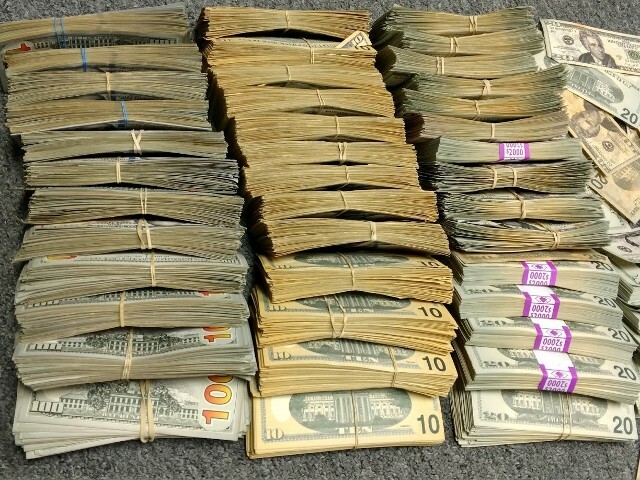 This is exactly what REAL Treasury Stacks look like. 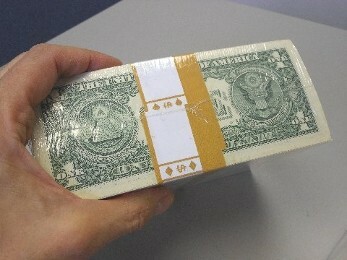 When you see money being delivered to a bank, this is how it arrives, straight from the Treasury. When we made this special project, we used a real $1 bill on the top and bottom of each stack, and we used 10 Filler Stacks inside. 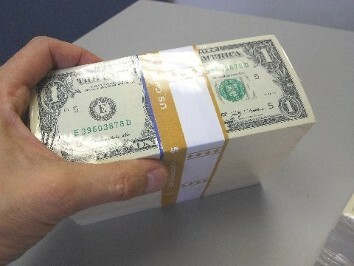 It looks exactly like a real Treasury stack! 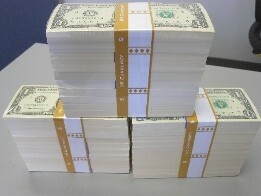 This is 1000 bills in a stack about 12" tall. We normally sell filler stacks for $45 each (there are 10 inside this). 10 Filler stacks x $45 ea = $450, but we sell each of these at a discount for only $350 each. 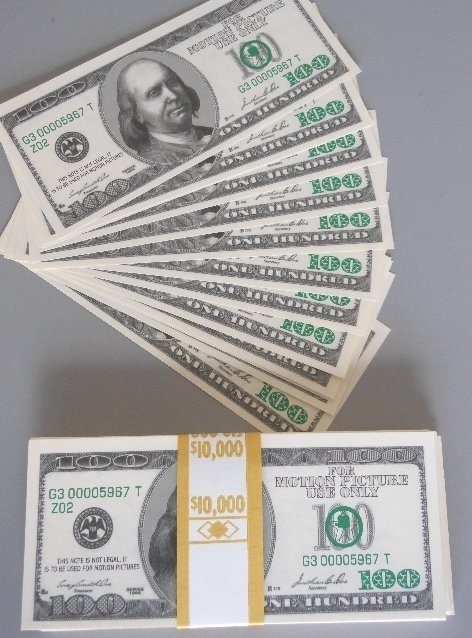 HIGH-GRADE TREASURY STACKS: If you get this with a High-Grade Prop bill on the top and bottom, filled with 10 stacks of high-grade filler stacks, the price is $550 ea. 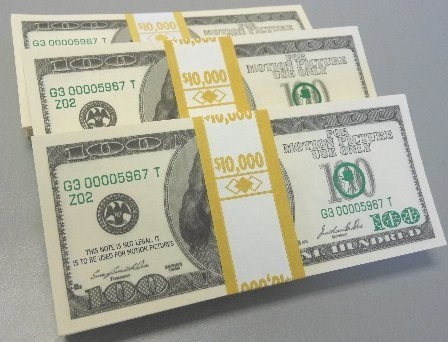 This looks VERY exactly like a real $100,000 Treasury stack. 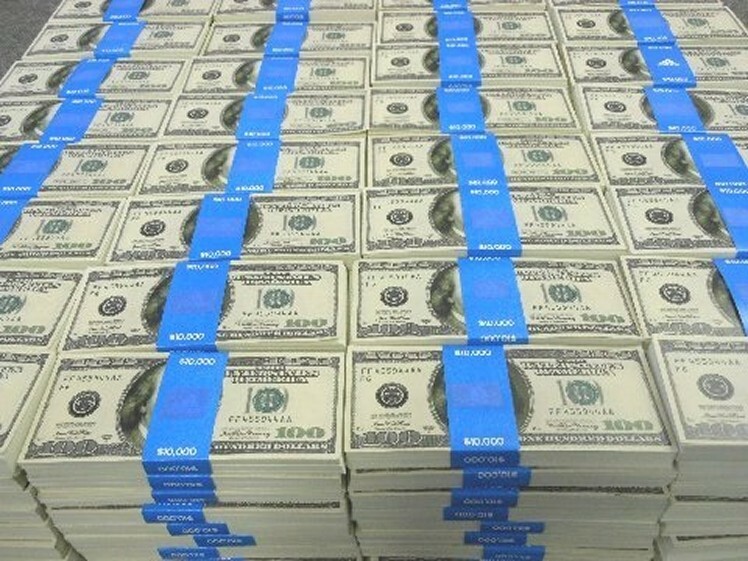 It contains 10 stacks of $10,000 each !!! This is incredibly realistic and giant !!! 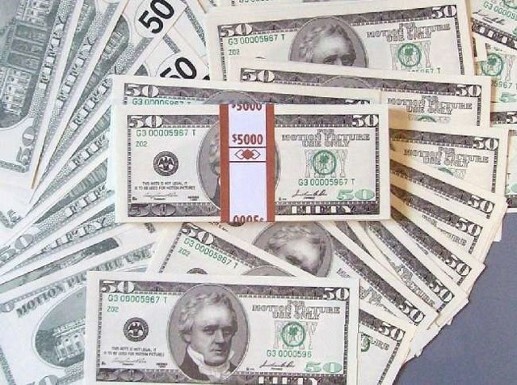 If we made it with REAL $100 bills, it would be $750: $550 for the 10 stacks, plus $200 for the two $100 bills on top and bottom. 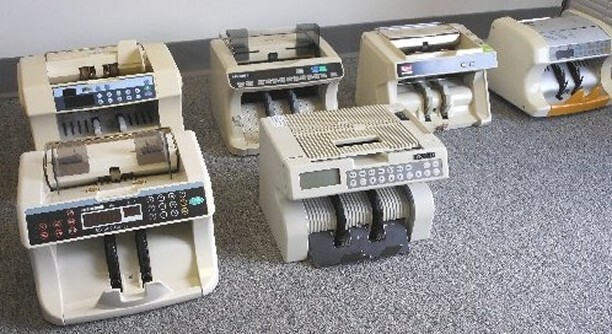 We have about 12-15 genuine cash counters in stock at any time. Some are working, some are non-working for dressing. 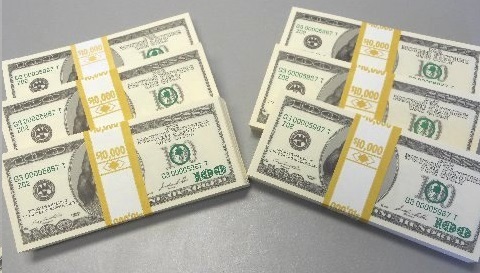 These are genuine money counters, in stock, ready for your production needs. We made 17 design changes to the front side, and 11 design changes made to the back side. Furthermore, the money is NOT printed on both sides. The back is totally blank. If you order fronts, they have NO back side. The back is left blank. If you order backs, we leave the front blank. Also, all original artwork has been replaced and completely redesigned with different artwork. It looks like real money at a quick glance, but looking closely reveals that it is completely different artwork, different seals, multiple warnings that it is NOT real, and that it is NOT for legal tender. The back side is totally BLANK to prevent anyone from thinking it's real. 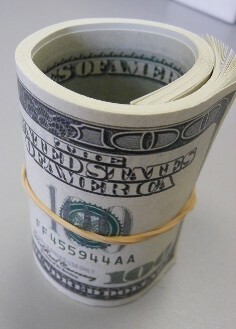 We have gone to great lengths to provide you with the very best Prop Money available. 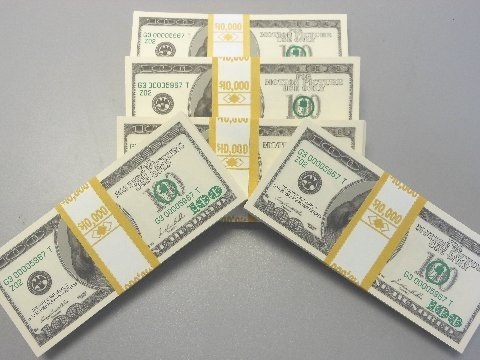 We sincerely hope you appreciate the quality, the safety controls and the artistic craftsmanship that have gone into the creation of this exceptional Prop Money.